Since the beginning of my teaching career, I have made a bet with Earth Science students. The bet is that if a student receives a grade higher than a 95 on the NYS Earth Science Regents Exam, I would dye my hair or wear a wig. The first student thus far to achieve this was Trentin Plew on the June 2017 exam. Once school started this year, Trentin wanted me to dye my hair bright pink. Thankfully, Mrs. Dimorier told me it wouldn't work on my dark hair. Informing Trentin of this terrible news, he happily decided on a clown wig. I wore this wig for the entire day on November 17th, 2017. 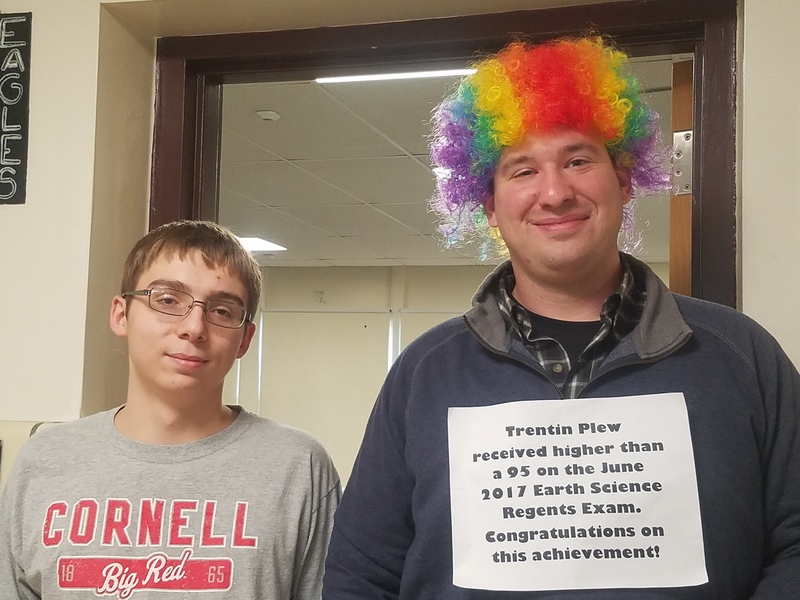 Congratulations Trentin! Hopefully, I get to continue this wonderful tradition with students every year at McGraw!